If you or someone you know is struggling with the air conditions at their home, maybe it’s time you suggest they get an air purifier. An air purifier can help eliminate harmful molecules and particles which attach themselves to oxygen molecules. These particles can be dangerous in large quantities and may cause your home to feel like it's stuffy or suffocating. If you’d like a better environment with an air purifier that is qualified to be used in large rooms, then keep reading. The Blueair Pure 211+ Air Purifier is designed to provide you with cleaner air and is designed to filter spaces of up to 540 square feet. It uses less energy than the other air purifiers on the market and is guaranteed to be quiet and less distracting, even on higher settings. The design is very sleek and modern, making it a piece of art as well as a working air purifier. This product is excellent for individuals who want to improve the air quality of their home. They may already have air filters, but not one that can handle large to extra-large rooms/spaces. If you’re searching for a model that is not only powerful but also quiet, this is the model for you. 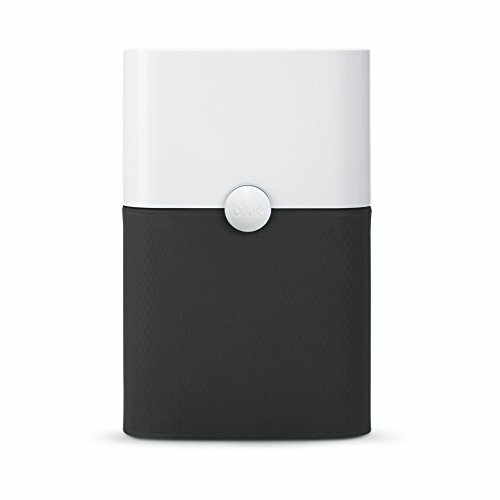 It has multiple filters that ensure that the air purifier is doing its work all day long. If you need to use it in a room where you work, or you have a family entertainment room, the product is designed specifically to operate with minimal sound. Included in your package will be the Blueair Pure 211+ Air Purifier, a collapsed carbon filter, and two fabric pre-filters. One is a dark shadow filter, and the other is a blue diva filter. You will also receive a power cord. It should be noted that you should replace the filter every six months. The Blueair Pure 211+ Air Purifier uses both a true HEPA filter and an activated carbon filter. The true HEPA filter can remove up to 99% of harmful particles that are 2.5 ppm or smaller. This is great for improving/eliminating pollutants such as allergens, dust, dirt, mold, odors, dander, and smoke. The activated carbon filter is excellent at removing larger particles which commonly cause odors from smoke, pets, people, cooking, and other odors. This is one of the top-rated air purifiers when it comes to low sound output and efficiency in energy use. It’s a 100% ozone-free filter and will not release any harmful pollutants that may be dangerous to humans and animals. The device has three different fan speeds, each of which can cover a different room size—large bedrooms, offices, family rooms, or college dorms. The maximum amount of space it can cover is up to 600 square feet. To use the filter, you first want to install the carbon filter by uncollapsing it. You can then adjust the settings to your liking and will need to wait for the filter to do its magic. This process will usually take up to 24 hours depending on which setting you set it at. Do not panic if the filter does not emit any noise or does not appear to be working, as it is just designed to operate quietly. You should see a difference after just 24 hours. After that, check the filter and if there are a few particles, then you’ll know it’s working well. If you’re not satisfied with the Blueair Pure 211+ Air Purifier output and features, then we can highly recommend the Blueair Pure 121 Air Purifier. This air purifier uses both a carbon filter and a true HEPA filter. It can operate at quiet settings and is still energy efficient. It’s ozone free and does not emit any UV rays or release any air pollutants that may be harmful to people or animals. It’s designed to be used in extra-large spaces such as living rooms, offices, or anywhere else. It can filter rooms of up to 700 square feet. If you’re looking for an air purifier that has multiple different filtration systems and also has a quiet mode of operating, then this should be a product you might want to investigate further. It not only looks great, but is also easy to use. The filters can pop right into the top of the device and can be ready to go in minutes. It’s specifically designed to be used in larger settings, so even if you're not using it in your home, it is more than well equipped to handle the environment. Use it to get rid of any pollutants or harmful particles that attach themselves to oxygen molecules in the air. You will no longer have to worry about the safety or air quality of the air in your home for your family, friends, and pets. Previous Post Fellowes AeraMax 300 Air Purifier Review Next Post Air Purifier For Allergies Do They Work?